There is this Vietnamese restaurant in or neighbourhood called “Chez Lien”. It offers a great variety of seafood, chicken, meat, vegetarian dishes, and the service is fast and hassle free. Then it has this heavenly tasting and smelling soup they call “home-made soup”. I love it so much that in certain cold, tired evenings I actually dream about having a nice, hot bowl brought to my door. Chicken broth (homemade), 3 cups. Portabella mushroom, 2, diced. Small fennel bulb, 1. Scallions, 2, thinly cut crosswise. Salt, powdered black pepper to taste (I like it spicy hot). Method: For chicken broth, in case you don’t already have it in your freezer J (well, in this case, it takes you more time and more ingredients you know!) In a medium size pot place half a skinless chicken, add one small onion, a pinch of salt and cover with 4 cups of water. Cook for half an hour. Take the chicken out and keep it for salad or sandwiches. Throw out the onion and pass the broth through fine meshed colander. This is the base of your soup. Preparing fennel: Cut the stalks and fronds off the bulb. Sit the bulb on its flat bottom and cut it in half. Cut off the little hard part out of the center of the fennel in each half. Then set the fennel halves cut side down and slice each half cross wise into thick slices. The soup: In a medium saucepan, pour broth add fennel slice, add a pinch of salt and black pepper and cook over medium heat for 10-15 minutes or until the fennel is soft but not mushy. Add instant noodle and cover the lid and cook another 5 minutes or so (until the noodle is ready). Two minutes before serving the soup add lime juice and sliced mushroom. When serving, make sure you have a bit of everything in each person’s little soup bowl. Sprinkle some sliced scallion for extra savory effects! Hi, I am familiar with the chez lien soup & I love it as well. Do you think using Campbells chicken stock would work as well? I am also looking for a recipe for their chicken(or beef) noodle saute… would you happen to have any info on that as well? 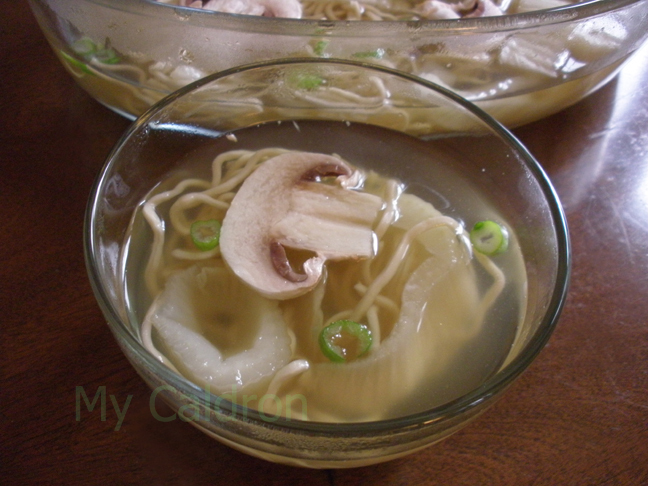 I love their variety of noodle sauté as well, but have never tried making them at home. If I ventured to try some, I will be sure to post a new blog entry about it.